This is a list of Nobel laureates who are either of Korean descent or were born in Korea. The following are the Nobel laureates who were Korean citizens at the time they were awarded the Nobel Prize. The laureates below were born in Korea but are not Korean. Cash-for-summit is the name of a political scandal that broke in South Korea in February 2003 and revolved around the secret payment by the Kim Dae-jung administration to North Korea of 500,000,000 dollars to secure the landmark June 2000 North–South summit between the two Koreas. 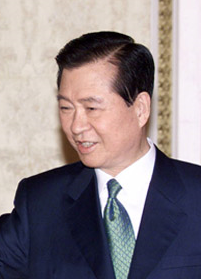 Kim Dae-jung, or Kim Dae Jung, was a South Korean politician who served as President of South Korea from 1998 to 2003. He was a 2000 Nobel Peace Prize recipient, the only Korean Nobel Prize recipient in history. He was sometimes referred to as the "Nelson Mandela of South Korea". Clare Hall is a constituent college of the University of Cambridge, England. Founded in 1966 by Clare College, Clare Hall is a college for advanced study, admitting only postgraduate students alongside postdoctoral researchers and fellows. It was established to serve as an Institute of Advanced Studies and has slowly grown and developed into a full constituent college. Charles John Pedersen was an American organic chemist best known for describing methods of synthesizing crown ethers. He shared the Nobel Prize in Chemistry in 1987 with Donald J. Cram and Jean-Marie Lehn. He is the only Nobel Prize laureate born in Korea other than Peace Prize laureate Kim Dae-jung. The Professor Thorolf Rafto Memorial Prize (Raftoprisen) is a human rights award established in the memory of the Norwegian human rights activist, Thorolf Rafto. Kim Geun-tae was a democracy activist and politician of the Republic of Korea. The Canadian Institute for Advanced Research (CIFAR) is an institute of advanced study that creates and maintains global research networks working on complex areas of inquiry. It is supported by individuals, foundations and corporations, as well as funding from the Government of Canada and the provinces of Quebec, Ontario, British Columbia and Alberta. It was founded in 1982. 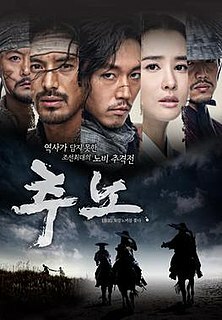 The Slave Hunters is a 2010 South Korean action historical drama set in the Joseon Dynasty about a slave hunter who is tracking down a general-turned-runaway slave as well as searching for the woman he loves. It aired on KBS2 from January 6 to March 25, 2010 on Wednesdays and Thursdays at 21:55 for 24 episodes. Kim Han-jung is a South Korean politician affiliated with the liberal Minjoo Party of Korea. He is a member of the Korean National Assembly representing the Namyanjgju constituency. Therese Jebsen is a Norwegian human-rights activist who is a senior advisor at the Rafto Foundation in Bergen, Norway. She was formerly the executive director of that organization. 2000 inter-Korean summit was a meeting between South Korean President Kim Dae-jung and the Democratic People's Republic of Korea's Chairman Kim Jong-il, which took place in Pyongyang from June 13 to June 15, 2000. It was the first inter-Korean summit since the Korean War 1950-1953. Regarding the first inter-Korean summit, the Nobel Peace Prize was awarded to Kim Dae-Jung for his work for democracy and human rights in North and South Korea in East Asia in general. Kim Dae Jung's Sunshine Policy for reconciliation with North Korea was recognized. The Reunification Democratic Party was a political party of South Korea from 1987 to 1990. The party was established in April 1987 by Kim Dae-jung and Kim Young-sam, splitting from the New Korea Democratic Party. The party faced another split later that year with Kim Dae-jung and his followers organizing Peace Democratic Party. The party later merged with conservative Democratic Justice Party and New Democratic Republican Party in January 1990. The party members who opposed the split formed the Democratic Party. The party had strong support in the Southeastern region of the country, including the South Gyeongsang Province and the city of Busan. ↑ "Kim Dae-jung – Facts". Nobel Foundation. ↑ "Charles J. Pedersen – Facts". Nobel Foundation. 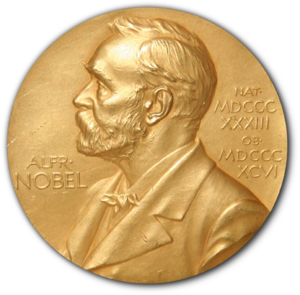 ↑ "Nobel Laureates and Country of Birth". Nobelprize.org.